Sandbags protect Wuhan residents on a street flooded by an overnight storm that dropped as much as 8 inches of rain in some districts, stopping traffic, cutting power and water supplies, and trapping people in their homes in many parts the metropolis on the Yangtze River on July 6, 2016. It’s like someone poked a hole in the sky, the rain just keeps pouring down, you can’t breathe,” said Mrs Wu from Donghu, a district in Wuhan a city in central China with over 10 million residents. Mrs Wu lives in Chunshuli, an affluent neighborhood that’s relatively high above sea level. But even so, she doesn’t feel safe. 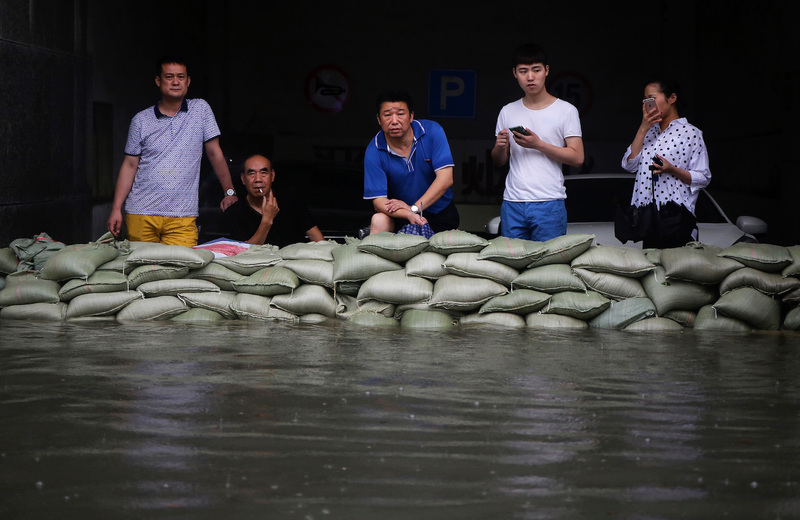 Since the beginning of July relentless downpours have overwhelmed Wuhan, paralyzing its transport system and plunging vast areas of the city into chaos. At the start of July, the Yangtze River Tunnel—a major arterial road linking the districts of Hankou and Wuchang—was temporarily closed, electric buses stopped running, river ferries stayed in harbour, bus routes diverted, and many subway stations closed affecting civilians and businesses. This year’s rainfall has already broken that record. Data from Wuhan’s meteorological authorities showed that between July 1-6, rainfall in Wuhan’s four main districts reached 932.6mm, 1087.2mm, 887mm and 833.9mm—as much as 549mm higher than 1998 levels in certain areas. China’s President Xi Jinping, has ordered the army to step up its relief efforts and work alongside especially trained flood rescue teams, such as the Yangtze Rescue Volunteers. Images of people trapped in their homes or rescue teams saving thousands of pigs, which had been stranded at their farm, have been widely shared on social media. The 1997-1998 El Niño caused U.S.$35 billion of damage and 23,000 deaths across the globe. Meterologists predict that this year’s El Niño could exact a heavy toll.